5k MoRun? Mo of the same please! This morning at 7am I was up and getting ready for my first 5k run. And when I say first, I mean first! The furthest I’ve ever been able to run has been 3k! This was also my first official, organized run and when I got up this morning I was soooo nervous! I hadn’t slept well, although I wasn’t tired and did feel energized. I got to the course extra early, as I didn’t want to arrive feeling rushed. I took the chance to soak up the atmosphere and shake off my nerves! I had so many thoughts and impressions of the morning, I can’t really share them all, but here are the highlights! On the way to the starting gates I made sure to head for the back of the starting pack, I knew I’d be slow and so I didn’t want to take off with all the fast people and feel demoralized from the start! It worked. What ended up happening was I got overtaken by the 10km crowd and that actually made me feel like a 10k’er! I followed my strategy, and ran across the start line, kept going for a bit then dropped into a quick walk. When I could see the 1km marker up ahead I picked up the pace and started running again. I ran until 3.5km, then walked again (of course, at this point I was heading up a long winding hill so the walk was well timed!). At the top of the hill I walked a few paces then started running again. I didn’t stop until I got crossed the finish line. I finished in 46:15. Not bad for my first 5k! Not bad at all! I will definitely be MoRunning again next year!! I knew I would have to walk at least 1km, so I decided to walk for part of the first km, then run to the 3km point, then I’d walk to 4 and run the rest of the way. I ended up running more than that. I was running to finish, and not bothered about my time (although I had an ‘ideal’ time I wanted to get), so I planned to ignore my watch as I ran. I never told a soul that I was hoping for an under 60min run, imagine my shock when I ended up at 46:15! I know I’m a slow runner, and so it was obvious I’d be at the back of the pack. But I did want to pass some people so I planned to pace myself for that as part of my motivation. I did pass some walkers, and that was enough for me! Other than that I just planned to enjoy it and celebrate crossing that finish line! The course: Running through beautiful parkland it was varied enough to be interesting and yet wasn’t distracting. I particularly loved the leaves gracefully falling from the trees onto the runners ahead of me, it looked like it belonged in a movie! The people: Lots and lots of people! All shapes, all sizes wearing all kinds of gear and costumes and mostly all laughing and smiling. I really loved the 5 runners who patted my shoulder as they ran past me, calling out ‘You go girl’ or ‘Well done’ etc. That was awesome. More people: Milling around at the finish, meeting people and getting a chat in with fellow runners and hopefully making new friends. The general atmosphere of awesomeness was..well…awesome! The finish line: Running up to the finish line was amazing, people cheering and clapping gave me the last push I needed to run past the finish line. I nearly cried of sheer happiness! I did it! I DID IT! I DID IT! The goodies: I loved the foil cape, it really kept me warm after the run! The official headband is fantastic, and of course, the medal is smokin’ awesome! My favourite souvenir (besides the medal of course) is my race number. Is it weird I’m thinking of framing it?! All in all, I’m so so glad I did this 5k. I’m delighted with myself for finishing under 50mins, and I’m really grateful to all my twitter followers for their encouragement and support! I couldn’t have done it without you! I’m so pleased you had such a fantastic run. Hopefully you’ll be entering more in the future and I’ll look forward to following your blog and hearing about your experiences. Well done you! Thank you! My next 5k is in December 😀 I’m hooked! Hey I was one of those that shouted encouragement at you! I saw the sign on your back and thought “well that’s just brilliant!”. I’m going to follow your blog & Twitter. 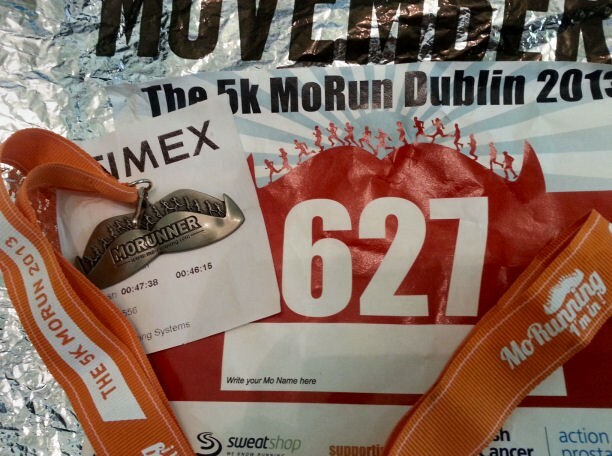 I started running this year too, and yes it was hard at first – it sometimes still is, I found the Mo 10k a haarrdd slog – but I’m definitely enjoying running so much now. I found running with Dublin Running Meetup groups really motivational. I’m even thinking of the Dingle Half Marathon next Sept (eeek!). Maybe I’ll see you there?! Keep it up, you are awesome.